Fifty-six U.S. Army medics competed in two-person teams during the punishing 72-hour Army Best Medic Competition at Fort Sam Houston, Texas, and Camp Bullis, Texas, from Oct. 29 to Nov. 2. Staff Sgt. Joseph M. Rangel and Staff Sgt. Richard Philbin, representing the 75th Ranger Regiment, won the competition. The Army’s Best Medic Competition is hosted by the U.S. Army Medical Command and by the U.S. Army Medical Department Center and School. This year’s competition included 28 teams and is designed to physically and intellectually challenge medics in a simulated tactical environment. Philbin believes they were selected because he and Rangel have served together previously and work well together as a team. Rangel explained that there wasn’t a need to prepare for the competition because being a Ranger, Rangers are always expected to perform at a higher level at all times. “We practice our normal SOPs and protocols throughout the training cycle. We went at it with what we had,” said Rangel. The competition is designed to test the medics’ medical proficiency and leadership while working together as a team. It is open to all Regular Army, Army Reserve, and Army National Guard soldiers, who have earned the Expert Field Medical Badge or the Combat Medical Badge. Competitors must be adaptive leaders who are tested in physical fitness (walking up to 30 miles throughout the competition), tactical pistol and rifle marksmanship, land navigation, and overall knowledge of medical, technical, and tactical proficiencies through hands-on tasks. Competitors’ skill sets must be a solid mix of tactical, technical and critical thinking in order to win the competition. 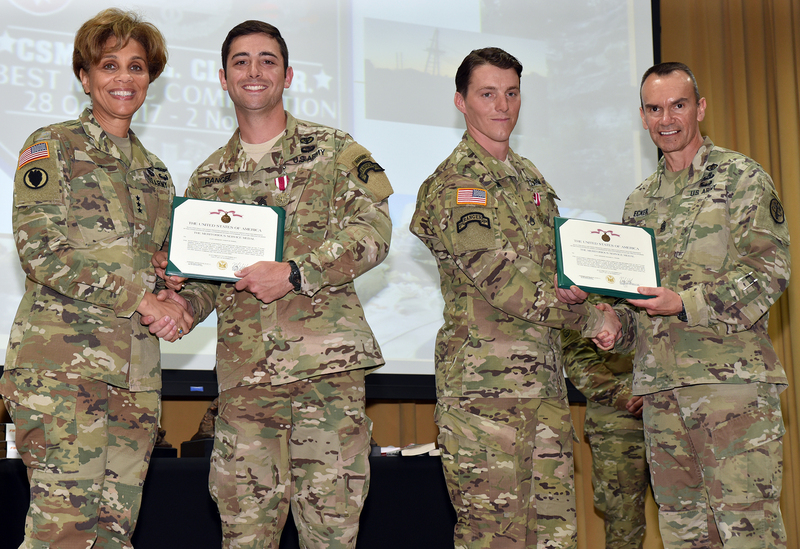 “This [competition] was a test to prepare you for the ultimate test on the battlefield – Go back to your units and share your excellence,” said Command Sgt. Maj. Gerald C. Ecker, U.S. Army Medical Command.